Norwich captain Russell Martin believes victory over Manchester United could be the "turning point" for their season. The Canaries won 2-1 at Old Trafford on Saturday to move two points clear of the Premier League relegation zone, a week after drawing with Everton. "Alex Neil questioned our desire at half-time against Everton," Martin told BBC Radio Norfolk. "In the second half against Everton and against Manchester United we have answered all of those questions." 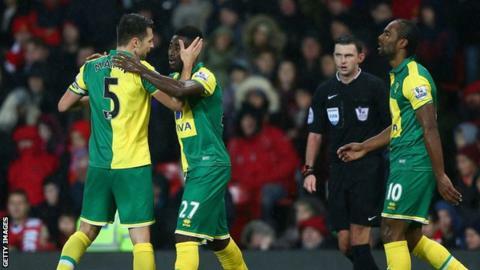 Victory over United saw Norwich rise to 16th in the Premier League table, as they picked up just their fourth win of the season. Martin said they sometimes had to adapt their style to compete in the top flight after winning promotion from the Championship in 2014-15. "We were used to winning and dominating games," the 29-year-old added. "Although we started playing that way we didn't pick up the points so of course people are going to ask questions and doubt us players and the manager. "Our identity last year was being aggressive, pressing high up the pitch but you cannot always do that in the Premier League. "We have a great team spirit and you have to have a bit of siege mentality when things are going wrong and people want to comment on it from the outside. "The gaffer is learning on the spot and so are we and I think this will be a turning point for us."